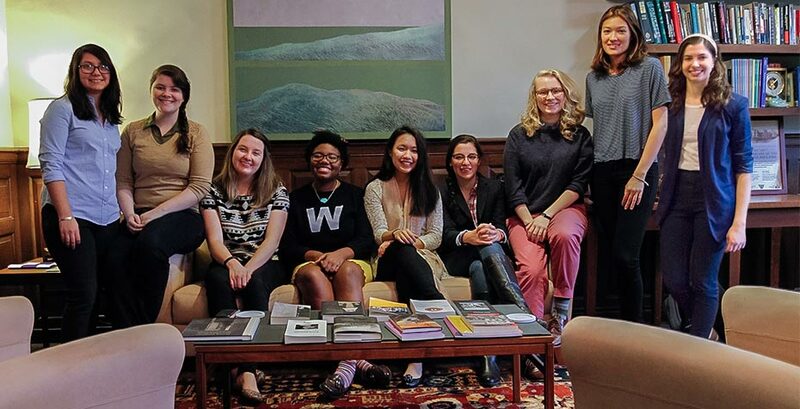 This fall, the Pamela Daniels Fellowship of $3,500 per recipient was awarded to four senior projects, each project exemplifying passionate engagement with a compelling intellectual subject. Meet the award recipients and their dream projects below. Whitman’s joy in working with multidimensional artistic materials was kindled in her high school sculpture classes. She postponed pursuing this passion to follow traditional life and job interests that were “applicable,” such as architecture and environmental studies. After taking Spatial Investigations with Visiting Lecturer in Art Andrew Mowbray and Advanced Sculpture with Professor of Art Carlos Dorrien, Whitman reconnected with a natural inclination toward using her hands as facilitators of artistic media. In the past, the Pamela Daniels Fellowship has been allocated to individual recipients. This year an ambitious six-student joint proposal was submitted as an opportunity to go beyond the achievement of self-directed endeavors and explore the capabilities of creative spirit inherent in collaboration. The group gravitated toward each other when they participated in Jay Craven’s Movies from Marlboro program in Vermont. The idea of constructing a series of professional-caliber short films came into fruition while the six Wellesley students were on set in Nantucket. Fendrock grew up hiking and playing in the woods. This intimate contact with nature developed her love for the Earth and a passion for studying it. Her advisor, Professor Emerita of Geosciences Margaret Thompson, studies the part of an ancient magmatic system on the North Shore called the Cape Ann pluton. Salem Neck, a region of this system, is “grossly oversimplified” on prevailing maps. In her project, Fendrock will construct detailed mapping and incorporate improved dating methods that will lay the groundwork for a better understanding of the area. Music has always captivated Audrey Tran, but she explains that, at Wellesley, “I refused to let music be defined as anything more than my “unpractical” hobby. I wanted my life and career to be nobly useful, which I interpreted to mean I needed to have an undergraduate education dedicated to biochemistry and a resume tailored to a career in medicine.” And yet, while working toward obtaining her biochemistry degree, Tran managed to keep her songwriting alive. She applied for the Pamela Daniels Fellowship with hopes of expanding her gift for music beyond intimate gigs in Harvard Square.